Good to see him bounce back with a sharp :47 2/5 work, out in 1:00 2/5 without blinkers. He just glided over the ground, cornered beautifully, and Victor Espinoza never moved a muscle on him down the stretch. He did everything effortlessly, throwing his ears around. Sherman, a bit concerned the San Felipe might have taken a little something out of him, indicated he would wait to decide on the Santa Anita Derby. But the colt quickly returned to his old self and all systems were go. With three straight monster efforts since December, and the Santa Anita Derby still to be run, will he be up to a peak performance on Derby Day? There are times when you would actually prefer to see a slight regression, because of how difficult it is to keep running these huge races and still move forward off them. So if he doesn’t dominate his opponents in the Santa Anita Derby the way he’s been doing, but is more workmanlike, that could be just what he needs at this point. He did appear to win the San Felipe under little urging in the final furlong, but when you run that big in fast time, it does take some kind of toll, especially if you keep doing it race after race. For him to keep piling up these runaway victories and huge speed figures without regressing shows what an exceptional horse he is. But no horse can keep that up over a period of time, so it may be time for him to back up just a little in order to re-energize for the Kentucky Derby. The Florida Derby (gr. I) couldn’t be setting up better for him, as he should be stalking three targets who want to be on or right off the lead and also happen to be the three horses to beat in what is shaping up as a six-horse field. His :50 4/5 breeze was a bit slower than McLaughlin was expecting, but at this stage it really doesn’t matter. McLaughlin is just trying to keep him where he’s at and it’s better to go a few ticks slower than go too fast. The last thing you want from a horse coming off a layoff is to be too sharp. It was about seven snowstorms ago that he last raced, so it will be good to finally see where he’s at after his nine-week vacation. Meanwhile, during his absence, the Derby landscape has changed dramatically and he’s going to wonder who all these new faces are when he gets in the paddock next Saturday. If it rains, however, and the track is off, he is booked on a flight to New York just in case. His career has been relatively brief, but he’s been like a rock – classy, honest, and dependable. If he can pull this off and win the Kentucky Derby off one race in 14 weeks, you can put another A+ on McLaughlin’s already impressive report card. Baffert would rather not have to send him cross-country for the third time and then back home and then to Kentucky, so he likely will stay home for the Santa Anita Derby. History would be against him if he tries to train him up to the Derby off a seven-week layoff and never having been farther than 1 1/16 miles. Baffert is the master at calling audibles, but at this point it looks as if he’s leaning toward sending Bayern to Oaklawn to try and pull a Bodemeister, especially to avoid a jockey conflict with Gary Stevens, who rides Candy Boy. The bottom line is, if Hoppertunity stays home and gets beat by California Chrome or Candy Boy, but runs a good solid race, there’s nothing wrong with that. He’s already had his battle test against top-class horses and passed that, so he doesn’t need to do anything spectacular in the Santa Anita Derby. If he can play Real Quiet to California Chrome’s Indian Charlie or Silver Charm to California Chrome’s Free House he’ll be just fine. It doesn’t seem as if he’ll be facing many new serious challengers in the Louisiana Derby (gr. II), mainly the same horses he beat in the Risen Star (gr. II). So, barring a bad trip, he should be right there again at the finish and should appreciate the extra distance more than the others. The most notable newcomer looks to be the speedy In Trouble, so that should only help him. For some reason, many horses seem to find trouble at Fair Grounds, especially those who try to come inside or through horses. With its long stretch, horses who swing wide and circle the field don’t suffer from the ground loss as they do at other tracks. This has proven to be a better-safe-than-sorry track, and he doesn’t need the points, so it’s more important to give him a good clean race than take any risks trying to win it in traffic. That’s certainly not to say he can’t, but why take the chance if you can avoid it? Just look at Palace Malice last year. Because of his horrendous trip trying to find an opening, he had to run in the Blue Grass Stakes in order to get enough points to make the Derby field. Intense Holiday tuned up for the race with a :49 2/5 breeze in company with Divine Oath. It remains to be seen to what extent the furor over the recent PETA video will prove a distraction. But with Scott Blasi relieved of his duties for the time being, perhaps the firestorm will begin to die down a bit. But as of now, his training for the Arkansas Derby should continue as normal. And after his performance in the Rebel, and with Hoppertunity likely staying in California, he’s going to be awfully tough to beat on April 12. It is still uncertain how far he wants to go, with a pedigree geared more for nine furlongs, but if he can settle right out of the gate and not waste energy in the first quarter mile, he does have a good chance to stretch out that additional quarter mile based on his talent and his toughness. Chances are, owner Ron Winchell will never have a better opportunity to win the Derby with a horse having this many ties to his father, going back several generations on both his sire and dam’s side. So this one will be special. Let’s just hope things run smoothly for the colt from now until the Derby. Before shipping up for the Withers, he worked a pair of miles in 1:41 4/5 and 1:46 3/5. Before shipping up for the Gotham, he breezed a mile in 1:45. This week, he breezed a mile in 1:45 for the Wood Memorial. We’ve got some old-school training going on here. If it works, don’t fix it, and Violette obviously is concentrating on building up his stamina and putting as much bottom into him as possible. His travel itinerary looks like that episode of “Seinfeld,” where you see the moving arrow going back and forth from New York to Florida, depicting Jerry’s trips. It is safe to say he has experienced more extreme climate changes in one winter than any other horse. He actually is in a similar position as General a Rod in that, with Social Inclusion in the field, this is his opportunity to finally not have to worry about Uncle Sigh and can concentrate on running his race. Remember him? It’s tough filling these bottom spots, but while on the subject of taking a step backwards, perhaps that’s all he was guilty of in the Risen Star when he had to be rushed out of the gate from the 13 post, was four wide into the turn and ran up on a horse’s heels on the turn, while much farther back than usual. He then made a startling run, passing six horses in a flash on the far turn to challenge for the lead, but simply got tired and was unable to sustain his run, finishing 5 1/2 lengths behind Albano, who he had beaten by 6 3/4 lengths in the LeComte. Most feel he’s not a mile and a quarter horse or even a mile and an eighth horse, but his maternal great-grandsires won the Breeders’ Cup Classic and Preakness, and his third dam, Jabot, is a half-sister to the top-class stayer Big Spruce, who defeated Forego in the Marlboro Cup and won graded stakes at 1 1/2 miles and 1 5/8 miles. Jabot also is a half-sister to Manta, a grade I winner at 1 1/4 and 1 1/8 miles who placed against colts in the Hollywood Gold Cup and 1 1/2-mile Oak Tree Invitational. It could be that he doesn’t want to stretch out any farther, but let’s give him another chance to bounce back from that defeat. His main concern right now would have to be Social Inclusion and what kind of strategy to use against him. He certainly doesn’t want to get in a speed duel with him or Samraat or In Trouble (if he runs). What he needs more than anything is to not draw inside again, as he did in the Withers and Gotham. He needs to be outside the speed if he’s going to have an opportunity to sit and stalk, which he certainly would want to do in the Kentucky Derby. He does have stamina on the bottom, but has to be given a chance to utilize it. NYRA tweeted he was going to work Tuesday March 25, and Contessa replied that it might be Wednesday, which would mean 10 days since his last work. Whatever brief work pattern he’s been on this year has been seven or eight days, but he’s obviously doing OK, so we’ll see what he does on the track this week. He’s turned in some fast works and perhaps long gallops have been the way to go as the distances begin to stretch out. The Arkansas Derby doesn’t look as if it’s going to have a large field, and likely will not have Hoppertunity, so this is his last chance to go back to the running style that suits him best, which is coming from off the pace. Running on the pace is not going to win him the Kentucky Derby and likely will not win him the Arkansas Derby. Any horse who closes the way he did in the Champagne against Havana and Honor Code should be using that same weapon in every race. His biggest concern, however, is his 0-for-3 record at Churchill Downs, where he’s been the favorite in two of those races. He hasn’t run badly there, but his third-place finish, beaten seven lengths, in the Street Sense Stakes as the even-money favorite coming off the Champagne was extremely disappointing. He did run a fast-closing second in his career debut at 5 1/2 furlongs, run in a snappy 1:03 3/5. Many feel SOCIAL INCLUSION should be in the Top 12, and maybe so, but if I’m going top keep BAYERN and CONSTITUTION off because they’ve had only two career starts and only one two-turn allowance race, and would be up against it having to go 1 1/4 miles in a 20-horse field with so little experience, I cannot justify putting Social Inclusion on at this time, even if he is destined to be a super horse. The other two colts may be as well. They will get their chance in the Wood Memorial, Florida Derby, and possibly Arkansas Derby to show just how special they are. Big Brown did when he easily won the Florida Derby from the 12 post. Imagine how the entire dynamics of the Derby trail would change if all three of these colts win their next start. And they certainly could. But for now I cannot separate them. In continuing the comments about what to expect from CALIFORNIA CHROME in the Santa Anita Derby, it should be noted that Secretariat, coming off a 1:33 2/5 mile in the Gotham, finished third in the Wood Memorial before sweeping the Triple Crown. Seattle Slew, after running seven furlongs in a track-record 1:20 3/5 and 1 1/8 miles in 1:47 2/5 in the Flamingo, was only workmanlike in winning the Wood Memorial in 1:49 3/5, coming home his final eighth in :13, before sweeping the Triple Crown. Affirmed, after winning the Santa Anita Derby by eight lengths under wraps, was in an all-out drive to win the Hollywood Derby by two lengths over a 28-1 shot named Think Snow before sweeping the Triple Crown. Citation took a step backward as a 3-year-old, getting beat by the unheralded Saggy in the Chesapeake Trial at 1-5 before sweeping the Triple Crown. Whirlaway lost his final two starts, at 3-5 and 1-2, before sweeping the Triple Crown. Assault, after winning the Wood Memorial, finished fourth in the Derby Trial Stakes before sweeping the Triple Crown. I just use these Triple Crown winners as an example that even the greatest 3-year-olds needed to take a step backward on their way to winning the Kentucky Derby, and most of them did it in their final race before the Derby. So, if California Chrome (and I’m certainly not suggesting he’s going to sweep the Triple Crown) takes a step backward in the Santa Anita Derby after running three monster races, there is no cause for alarm. Getting back to RING WEEKEND’S pedigree, it is as unconventional as he is. In addition to being inbred to Fappiano through Unbridled and Cryptoclearance, in the first five generations of his tail-female family alone, which is all European, are the individual winners of the English 2,000 Guineas, French 2,000 Guineas, Irish 2,000 Guineas, Irish Derby, French Derby, and Irish Oaks. So, there is a great mix of mile speed and pure stamina. 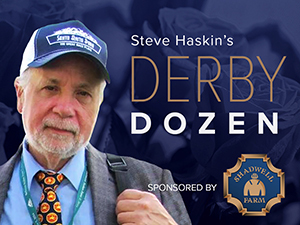 The story of this year’s Derby in a nutshell – Breeders’ Cup Juvenile winner gone, Champagne winner gone, Remsen winner gone, CashCall Futurity winner gone, FrontRunner winner gone, 2-year-old champion gone, consensus Derby favorite Top Billing gone. And then we come to the only grade I winner who is not gone, and he’s not even a dirt horse. There’s not much to say about the Spiral Stakes. We know WE MISS ARTIE is at his best on Polytrack, and while it’s always great having Ken Ramsey in the Derby and understand his desire to compete, this colt hasn’t shown anything on the dirt to suggest he can be competitive against grade I and grade II horses in a classic. But he is the only 3-year-old who has won a grade I and a grade II stakes. Yes, Animal Kingdom used the Spiral as a steppingstone to a Derby victory, but he was an exceptionally talented colt and had never run on dirt before the Derby, so he had the unknown factor going for him. There is nothing unknown about We Miss Artie’s form on dirt. Speaking of the Spiral, did anyone watching the race and seeing all that kickback wish all the horses had been equipped with goggles? That looked like a rough go if you weren’t in the clear, as the winner was. You had to be impressed with CHITU’S time of 1:47 4/5 in the Sunland Derby, but I don’t know that I saw anything to suggest he wants to stretch out another quarter of a mile. He came home in :13 1/5 against a pretty strong headwind, so you can’t hold that against him. But he was trying to get out in the upper stretch and did shove MIDNIGHT HAWK out a couple of paths. And the third horse, COMMISSIONER, lost s shoe when he stumbled at the start and had to come from last to pick up a piece of it. So there no doubt are better days in store for him. His problem now is getting in the Derby with 10 points. There is no denying Chitu’s speed and talent; his record tells you all you need to know. But he is by the sprinter Henny Hughes, and even though there is stamina in his female family through A.P. Indy, Irish River, and Nijinsky II, his great-grandsire Zilzal was strictly a miler. So, his pedigree for 10 furlongs is iffy at best, but he is a very talented colt. A few under-the-radar horses you don’t want to forget about are TONALIST, whose been getting plenty of bottom at Payson Park and could be heading to the Wood Memorial, and WICKED STRONG, who turned in a sharp six-furlong work in 1:13 2/5 at Palm Meadows. You would think this colt would welcome a one-way ticket out of Florida and try to return to his Remsen form somewhere else for one last shot at getting in the Derby. I still can’t help but feel he is so much better than he showed at Gulfstream. The other option for Tonalist is the Calder Derby, but that would mean the Kentucky Derby is not in the plan, Even if he were to win the Calder Derby he would have zero points for the Kentucky Derby. Although I wasn’t crazy about the way CONQUEST TITAN was unable to sustain his run in the Tampa Bay Derby, I still believe this colt can compete with anyone and will chalk that race up to a combination of the deep, quirky surface and a less-than-ideal trip, in which he had his momentum stopped while making a big early move up the inside. This is a one-run horse and sometimes it’s difficult for horses like him to sustain a second long run after being asked to use his run early and having nowhere to go at a crucial point in the race. Any horse who can pass Intense Holiday in the final furlong is a good horse and a dangerous closer. He breezed five furlongs in 1:01 at Palm Meadows, and we’ll see where he shows up next. Could be the Arkansas Derby, and there’s a good chance he will be back on the Dozen before then, as soon as I know his plans for sure. One rule of racing this time of year: Never count Nick Zito out of the Florida Derby. Zito has won the race three times and was beaten photos in a couple more. This year, he has an unknown quantity in SPOT, who will be stretching out to two turns. But his victory in the Swale Stakes was very impressive, despite not changing leads, and he is bred to go longer. And he should get a great pace setup, ,so watch out for him in the final furlong. Zito is hungry to get back on the Derby trail, especially not having taken home the roses in 20 years. He is one-for-one with Spot, who just may have found a home in Zito’s barn. BAYERN drilled a half in :47 2/5 at Santa Anita in company and looked very good doing it. This colt has an efficient stride with little wasted action, but having only three career starts before the Derby is an extremely tall order, especially not having raced at 2 and having only two of those races around two turns. WILDCAT RED looks to be the speed of the Florida Derby, although he has shown he can lay just off the pace. He honed his speed with a :35 2/5 drill, out in :48 4/5. Louisiana Derby works include RISE UP, who breezed a sharp half in :47 2/5, second fastest of 67 works at the distance; VICAR’S IN TROUBLE, who breezed an easy five furlongs in 1:03 3/5; COMMANDING CURVE, who turned in a solid five-furlong breeze in 1:01 2/5; GOLD HAWK breezed a half in :50 3/5; and LOUIES FLOWER, who breezed a half in :48 4/5. A decision on IN TROUBLE will be made shortly, whether to return to New York for the Wood Memorial or go to Fair Grounds for the Louisiana Derby. He indicated his sharpness by working five furlongs in 1:00 flat at Palm Meadows. CONSTITUTION breezed a half in :49 1/5 for the Florida Derby. Jerome winner NOBLE MOON, whose status for the Wood Memorial is up in the air, breezed a mile in 1:46 at Belmont. He is another who was given a vacation in January.